This article is about the legitimate use of February 30 in calendar systems. For its use as a non-existent date, see February 31. February 30 occurs in some calendars, but not in the Gregorian calendar, where February contains only 28, or in a leap year, 29 days. February 30 is usually used as a sarcastic date for referring to something that will never happen or will never be done. Instead of changing from the Julian calendar to the Gregorian calendar by omitting a block of consecutive days as had been done in other countries, the Swedish Empire planned to change gradually by omitting all leap days for the entire period from 1700 to 1740 inclusive. Although the leap day was omitted in February 1700, the Great Northern War began later that year, diverting the attention of the Swedes from their calendar so that they did not omit leap days on the next two occasions and 1704 and 1708 remained leap years. To avoid confusion and further mistakes, the Julian calendar was restored in 1712 by adding an extra leap day, thus giving that year the only 30th of February in history. That date corresponded to February 29 in the Julian calendar and to March 11 in the Gregorian calendar. 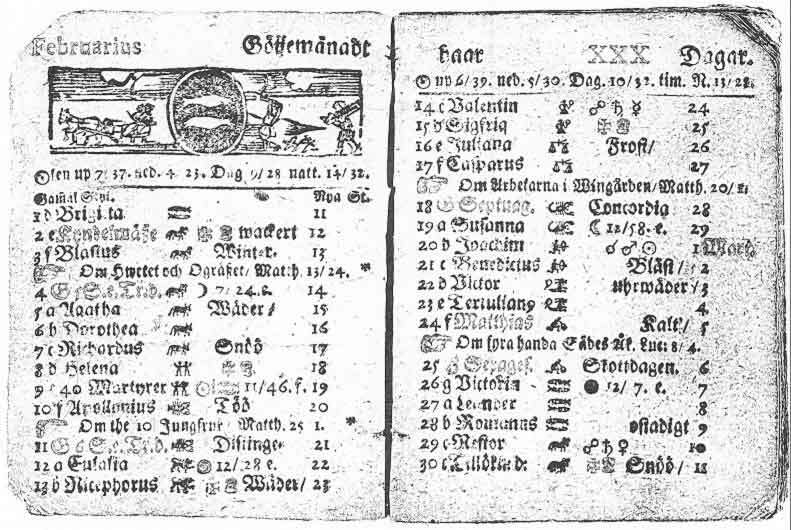 The Swedish conversion to the Gregorian calendar was finally accomplished in the usual way in 1753, by omitting the last 11 days of February. Due to evening out the months being part of the rationale for reforming the calendar, some reform calendars, such as the World Calendar and the Hanke-Henry Permanent Calendar, contain a 30-day February. The Symmetry454 calendar contains a 35-day February. In J.R.R. Tolkien's Middle-earth legendarium, the Hobbits have developed the Shire Reckoning. According to Appendix D to The Lord of the Rings written by Tolkien, this calendar has arranged the year neatly in 12 months of 30 days each. The month the Hobbits call "Solmath", is rendered in the text as "February", and therefore the date February 30 exists in the narrative. ^ "Thirty Days Hath February 2000?". About.com. http://urbanlegends.about.com/library/weekly/aa020399.htm. Retrieved 7 November 2013. ^ See Soviet calendar for a comprehensive list of sources, both for and against 30-day months. The Oxford Companion to the Year. Bonnie Blackburn & Leofranc Holford-Strevens. Oxford University Press 1999. ISBN 0-19-214231-3. Pages 98–99. This page uses content from the English language Wikipedia. The original content was at February 30. The list of authors can be seen in the page history. As with this Familypedia wiki, the content of Wikipedia is available under the Creative Commons License.